Checkmate proposes a critical journey to discover the capacity of art to confound viewers, both visually and conceptually. Cortesi Gallery is delighted to present Checkmate. Games of International Art from the Sixties to Now, a group exhibition featuring works by Alberto Biasi, Alighiero Boetti, Agostino Bonalumi, Enrico Castellani, Tony Cragg, Piero Dorazio, Tano Festa, Lucio Fontana, Joseph Kosuth, Heinz Mack, Giulio Paolini, Jesús-Rafael Soto, Grazia Varisco. Checkmate proposes a critical journey to discover the capacity of art to confound viewers, both visually and conceptually. Not only can an artwork surprise with the provocation of its forms, but it also creates short-circuits among different elements, thus revealing further levels of interpretation that challenge ideas of space, time and language. The exhibition plays on multiple significances, starting from its title, which could refer to a checkered board, a grid that the artist uses to organise intuition within the parameters of language; or a chessboard, where strategies come together to confront viewers. Checkmate explores relationships between works from the 50s and the 70s, as well as more recent pieces. The narrative’s point of departure begins with a work realised by Giulio Paolini in 2007 (Zeusi e Parrasio) and another by Tony Cragg from 2007 (Points of View), installed along a diagonal that cuts through the gallery space. Both works question a mysterious element that often surrounds works of art, something that Paolini evokes when speaking about his lyric and metaphysic installation (of which another version can be found at Castello di Rivoli): “The author, a rival to himself, disappears in front of the work of art, as if left waiting for the image”. This “waiting for the image” is also apparent in Cragg’s sculpture, presented in open dialogue with Paolini’s work, whereprofiles merge and become lost in an alternation of volumes and voids. In fact, ambiguity leads the game played in Checkmate: from Joseph Kosuth’s Art as Idea as Idea (1967) to Alighiero Boetti’s Uno, cento, mille (1979), where the alphabet has been crossed out with blue pen strokes and the only traces left are commas, which give space to the intuition of the untold. In direct dialogue with these two works is Heinz Mack’s metaphysic landscape Orizzonte+Piramide (1972), an aluminium board where a pyramid based on the horizon points to another, further away, in a conceptual game of references. 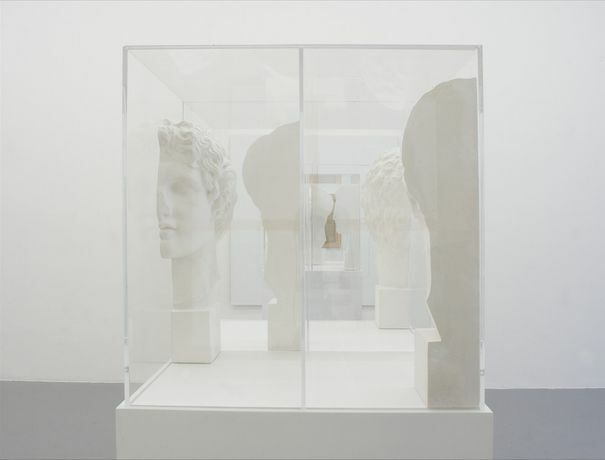 The post-spatialist and kinetic works featured in the exhibition play with the senses in a similar way: Enrico Castellani’s Superficie (1987), an alternation of shadow and light; the extroflexed canvas by Agostino Bonalumi; the optical-dynamic Lamellar Reliefs of Alberto Biasi (1962–1966); the reticular painting Piccola Premura (1962–1963) by Piero Dorazio, which brings up all the hues of orange and blue; and Jesús Rafael Soto’s Purpura y plata (1969), where a flat, solid red painted field is presented in stark contrast with a vibrating grid of aluminium. Finally, The reds and blues of the open curtain that reveals Tano Festa’s Particolare della finestra (Detail of Window) (1965) force one to look at the exhibition from a new perspective, inviting visitors to come up with their own rules for the game, map their own journey through the languages of the eye, freely put together and take apart their own aesthetic vision, giving them tools to describe and interpret the work of art. New discourses between emotion, relationships and gaze are created via the three Tavole Magnetiche by Grazia Varisco, created towards the end of the 50s and the start of the 60s.